On Tone 3 the Dream of our Intention is brought to Life by Wind/IK… the Breath of Life and Breath of Spirit. A dream stays a dream in the realm of spirit until we act on it in the physical realm of existence. Our Movement toward an Intention of Love draws something from Heaven to Earth. Like a first movement in the womb, what was created begins to follow its own course of being. The 3rd Tone in the 3rd Uinal, reflect the Master Number 33. Number 3 is the number of the Ascended Masters, and the encouragement that they are near to help us manifest our Dream. Wind/IK is a Day Sign of the North. This is the direction of the Old Ones, the Ascended Masters who walked this way before. 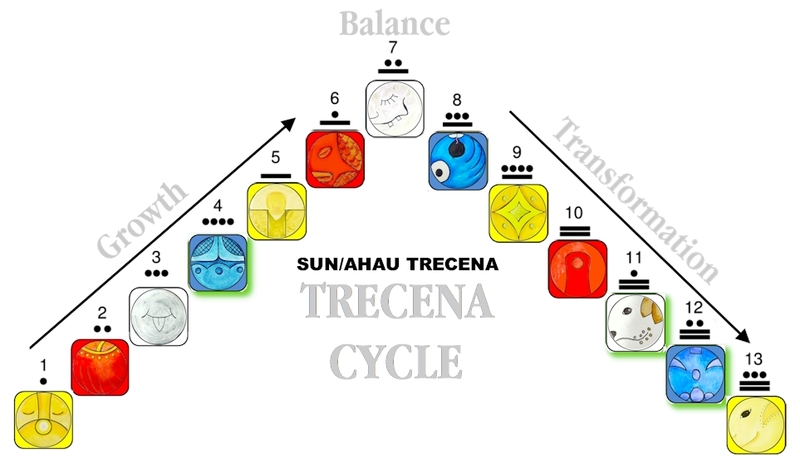 We are led by Sun/AHAU, another symbol of the Creator, the Ascended Masters, and a connection to their Sacred Wisdom. This is a day when we would feel and see their presence in the wind. As the Element of Air, we are connected to the Whole of Humanity with every breath we take. And with every breath, the words of Creation that were Spoken by an Almighty Creator are drawn into our Being. The Cherokee Whirlwind symbolizes a double spiral helix of rising smoke that carries our prayers to the Creator. They saw this rising smoke as the channel through which we could draw wisdom from the above to the below. Wind/IK is a symbol of the One Breath shared by Humanity that draws Life as we Breathe and are Breathed by Spirit. Tone 3’s Movement is our first expression of our Dream. Wind/IK embodies the ability to communicate and disseminate good thoughts and ideas. The glyph represents the portals carved in stone that would magnify the sound and vibration of our communion with the Creator. Tone 3 begins the Journey of our Dream as we take a first step that would lead us from our Point A to Point B. Static energy is transformed into dynamic energy through movement. We manifest our Highest Power of Creation when our Dream is offered to the Creator in our Prayers of Humility. One day we will know that our limitations of Creation have nothing to do with whether we are capable or incapable. The Dream holds the magic to manifest itself when the Dream Itself is worthy of the Creator. Through the Creator’s intention of Divine Justice, when our Dream is aligned with the Creator’s Dream, we are aligned in the flow and rhythm of a Supernatural Force of Creation. On 3 Wind/IK our most important Communication of Intention is our Prayer to the Creator. Walking with the Old Ones, and being reminded again by Wind/IK that we are connected to the Source of Spiritual Wisdom, we are called to the old and proven ways of Drawing our Own Consciousness to the Creator. IMIX taught us to Create from the realm of our Imagination. Sacred Ritual and Ceremony was a way of Movement in the natural world that reflected a Communication in Spirit. When we light candles and hold their image as God’s Light on Earth, when we burn sage and sweetgrass to illustrate our prayers rising to the Creator, when we make a Sacred Offering of our Intention, we create the vibration of a movement in correspondence with a Divine Dream. We draw down a Creation from the Above to the Below. This is a Day to Listen for the Guidance of the Old Ones. We might remember all the ways our Ancestors expressed their Communion with the Creator. Some expressed their prayers through dance. Some counted beads. Some prayers are conveyed in chants, some by drums, and some were songs. Some fasted and isolated themselves in nature to seek a vision. Some climbed mountains, while others immersed themselves in Holy Water. Some express their prayers through works of art. The Cherokee Day Sign of the Whirlwind/AGALU’GA is the 13th Dancer, the ethereal leader in the Dance of the Constellations. Whirlwind reflects the Whirling of Life and the Breath of the Universe. Through our Spoken Words we have the Power to draw Life and Healing to the World. On our first day of movement in an effort to become the Hands of God, Wind/IK calls attention to our breath and to our Spoken Words. Our Prayers of Movement, Song, and Artistic Expression declare the Power of the Creator to fulfill our Shared Dream of Peace and Harmony. To all my relations, in our Dream of Hope for Humanity, may we raise our own Prayers to the Creator. May we express, in our own way, our Adoration, Gratitude, and Humility for a Creator who Dreamed a Creation that would manifest Harmony and Justice. May we Know that the Diversity in the way we worship, is carried on the wind to the Creator as One Song in a Divine Chorus. May we recreate the “Lost Chord” of Humanity. May we employ the Proven and Worthy tools that were preserved by the generations of our Grandfathers and Grandmothers, honoring all the ways we Call to Spirit. May we raise a Voice together as Music to the Creator that solicits a Divine Response, and “listen to the wind” for the Answer. May we Know the Abiding Love of the Creator, through the Element of Air – as the breeze that caresses our cheek, yet is also powerful enough to change the landscape of our lives. May we be re-tuned to a Higher Frequency of Love that vibrates in Harmony with the Voice of the Creator. May we give thanks to the Ancestors who prayed for US in their own way, seven generations ago.